The Expedition is at last under way!! This is written in camp at Calais, where we have decided to stop 2-3 days to rest after the last few hectic days. The Cyprus affair seems to be resolving itself; meanwhile we continue. Barrs Leaks has cured the radiator, which had been leaking slightly. The spring "clonk" remains to be fixed anon. Radio interference is being caused by a dodgy dynamo suppressor. We have a spare. Working till well past midnight the last few days, packing up, etc. We got away at 0700A this morning; 200 yards from home, one of Shadowfax' shock-absorber bolts came out. A good start! Fixed on the spot and continued, reaching Ramsgate at 1020A. Initial odometer reading =31558M (London). In camp on the sand-dunes outside Calais (amid old wartime defences and "No Camping" signs), we hope to live on $5 each for 3 days, resting and reorganising. Many errors in packing, and redundant items, are already becoming apparent. (Morning) We are camped in the sand-dunes behind Bleriot-Plage (just west of Calais), amid old German fortifications. Unlike the British side, these have not been demolished. Battle scars still visible. The main annoyance here is the wind! It never stops, and blows sand around something rotten! When inflating tyres in sand, always stand the footpump on something large; not only will it sink in, but it will draw in sand, and blow same into the tyre valves. We have re-packed Orodruin, with various items, including Keith's personal crate, on the roof to make more room inside. Today we hope to strip off the front spring., and fix the "clonk" by driving shims into the spring-eyes. There is no further evidence of radiator leaks, but the expansion bottle always seems to run nearly empty. This must be assumed normal, since the level in the main tank is always satisfactory. Living can be surprisingly cheap here (as Keith predicted), the main staple being bread and cheese, with wine. at 3F (i.e. around 30P)/bottle. French restaurant coffee, at 1F/cup, is very nice, but definitely a luxury. On examining the spring, it was found to have been fitted slightly skew, i.e. a drift off-centre in opposite directions at each end. This was straightened by suspiciously light hammer-blows. A test-run confirmed the "clonk" still there. While cutting bread for tea, Keith sustained a very deep gash in his right forefinger, going clear to the bone. Immediately revealed a fault in our first-aid arrangements, the large wooden crate is too unwieldy for emergencies. So we shall pack a running stock of bandages, etc., in a small ammo box. In France one does get free medical treatment, but only at a hospital. Doctors will charge you. Keith patched up, with three stitches which he must take out himself in a week. A bright sunny day (unlike yesterday). Getting up late again, and started fixing our spring, while Rik and Brian commissioned their winch (which, due to lack of time, had not been fully installed in England). One bush so loose you could see daylight down the side of it. Came out very easily, and polish-marks on it. Obviously, it had been moving. Both bushes replaced with a 24G steel shim around them, they then required really hard driving in. Replacing the spring required devious bodgery with three jacks and a tyre-lever to force it into place. Cured the "clonk", however. Meanwhile, Rik sliced the top off his right index finger in the fanbelt nip on his engine, while adjusting the winch. Hospital again. They let him out with a large bandage and a tetanus jab. No permanent damage done. Two serious incidents in two days, far too accident-prone for safety. With Brian in Shadowfax, at the Belgian frontier on the Brussels Autoroute. We set off this morning, around 1130A. Stopped in Calais for Keith to post a letter home; after buying some bread and cheese, and forgetting same in the Sylver Pils cafe! Shadowfax running in 4-wheel drive. Then, between Dunkerque and Lille, Shadowfax began misfiring horribly on load; believed to be due to a dirty carburettor. I swapped places with Rik, to try to diagnose it (Keith driving after a lunchtime stop at an Autoroute service area, where we were given a loaf of bread by some fellow Englishmen we met there). We lost our way hopelessly in the tangle of new Autoroutes around Lille, at around 1400A. The fate of Orodruin, Rik and Keith still is not known. We waited in Villeneuve d'Ascq (just out of Roubaix) hoping they would catch up, but they didn't. Trogged around Roubaix and environs for hours, Shadowfax' engine getting steadily worse, and finally decided to set out for the border, hoping to meet the others there. (Rik and I have each others' passports, so neither can cross over). I now believe their guess at roads when we separated was, in fact, correct; it should have led to this very point (the frontier post). The French police here know the situation, and have Orodruin's number; but I don't think they mean to put out a call for them. Now getting dark. Brian and I mean to spend the night here, and reassess the situation in the morning. B**** chapter of accidents, this first week! Brian and I slept (in Shadowfax) in the bonded lorry park at the Customs post (the mad English again!). In the morning, I stripped the carburettor and distributor. The carburettor was okay, but the distributor was ghastly inside. Horribly worn. I have done what I can, cleaned and oiled the mechanism, polished and gapped points, etc. Timing is roughly reset by ear. I am writing this while Brian drives back to Bleriot, then (if we don't find them) leaving a message with Jean in London, and returning to the border to await them. We are now negotiating the Autoroute "Get you lost machine" through Lille. The engine now running perfectly, albeit a little underpowered. Not surprising, as I have only rough-tuned it, and intentionally erred on the late side of ignition timing. On arrival at Bleriot, no sign of Orodruin. We shall wait until after the "siesta", then try to phone Jean. We went into Calais, and contacted the British Vice-Consul. The Lille Consulate have not heard of the others, but are now notified to expect them. The Vice-Consul asked us to remain at our campsite at Bleriot, and call into the office regularly for news. If asked, he will contact Brussels at our expense, but this should not be necessary, since they are unlikely to enter Belgium with wrong papers. We failed to contact Jean (lines engaged), so back to the campsite to wait until evening and try again. Meanwhile, the lack of power in Shadowfax was traced to a maladjusted throttle linkage. This fixed, plenty of power there now. Brian has also adjusted the clutch. Now worth the effort of driving it! Later, we succeeded in contacting Jean. No word of the others, we have left a message with her that we are waiting at Calais. We have pitched camp on the old site, to await developments. Bleriot is a rather odd place, right on the outskirts of Calais. A modern seaside resort at one end, with all the trimmings, and something of a shanty-town of (probably) wartime asbestos-cement cottages ribboned out along the coast road at the other (Western) end. Late afternoon in Bleriot. Still no news. It is now our third day alone, after some 51 hours. The Vice-Consul in Calais has stirred up the French authorities (who apparently will not help individuals), and has spread a police dragnet clear across Europe for Orodruin. As he pointed out, no news is, to some extent, good news as, had they met with an accident, the British diplomatic service would have been automatically notified. Hence they are okay, wherever they are. Spent part of the day repacking Shadowfax. Carrying out vehicle repairs, etc., in sand is a very mixed blessing/curse. Of course the stuff gets everywhere, and must be rigorously excluded from working parts, but it nevertheless provides a constantly cleaned mat on which to work under a vehicle. This stay on the beach is very good training for the desert. The fourth day of our enforced separation. Still at Calais. It is now Thursday; we have been a full week on the Continent (and have achieved nothing!). Last night, Brian and I were amazed to see a British couple drive into the dunes, dump a pair of old car doors, and drive off again! The mad English. A middle-aged couple, to boot. Later, we went on a tour of exploration of the German defences between here and Calais. Very elaborate, but no installations, lighting, etc., left. Just empty blockhouses. Interestingly enough, with several gun-emplacements facing inland. After a clothes-washing session, and feeding, we set off for Calais, to check again with the Vice-Consulate. The Consulate had no news, but a phone-call to Jean resolved the problem. Orodruin had entered Belgium, and is waiting at the Autoroute border-post at Aachen on the Belgian/German border. So, after notifying the Consulate, we set off after them, leaving Calais at 1335A. En route out of Calais, an incredible notice, clearly officially stencilled on a wall: "Defense d'Uriner". Wouldya believe it!! A good fast run over the incredibly flat plain of northern France. Shadowfax now running very well. Having again been muddled by the Autoroute system around Lille (our map shows Autoroutes that are not yet built, and others as half-built that are in fact, open) we ended up on the Paris Autoroute. Breaking off at Carvin, we headed south toward Valenciennes, and the southern branch of the Brussels Autoroute. Some appalling road surfaces between Carvin and Orchies (N354), but the N353 on to Valenciennes is much better. This written at 1650A, some 20km north of Valenciennes, with 110 miles on the clock from Calais. Written in a commercial campsite by the Rhine, just south of Cologne. Mileage (Orodruin) =32143. On missing us at Lille, they proceeded (ahead of us) to the Roubaix border crossing, to be told we had already passed through! Hence they went straight on to Aachen, and waited at the Autoroute there (before the German crossing), and called Jean at regular intervals. Frequently searched and moved on by police (so much for the Interpol dragnet!). Eventually we reached them on the Autoroute, amid scenes of wild rejoicing. We met up at 2015A, and decided to spend the night in an Autoroute layby (camping is illegal here, but you can usually get away with one night). We made Cologne about 1300A, a campsite cost DM14 for the four of us. We have made friends with another group of British vagrants (! ), touring Europe as a practice run for a world-tour next year. Orodruin's voltage regulator is still on the blink, we shall fit the spare unit. BBC World Service morning news is readily receivable on the 31m band. We are still at the campsite at 1600A. We have spent today overhauling the vehicles, Shadowfax checking brakes and wheelhubs, Orodruin replacing the voltage regulator. The new regulator appears to be no improvement. Time will tell, however. We have decided to skip Berlin in the interests of economy (it would cost some £70), and go Mannheim - Prague - Romania. Now we are caught by rain in the campsite. We are staying a second day in said campsite, as Shadowfax has developed a bad hydraulic leak, which will require shopping in Cologne for spares. The instant first-aid ammo box is now packed, and is carried on the floor in front. Keith has taken the stitches out of his finger; no complications. Last night, it RAINED!! Like, two inches of rain in four hours! The whole field awash, both tents got water in. Massive drying operation this morning, but now (1120A) it is raining again. You can't win. Rik and Brian have a spare brake cylinder (RH rear), so hope to clear the leak without buying anything. Calculations show that, from London, Orodruin has averaged almost exactly 15mpg, including all town and sand-dune work, etc. Shadowfax' brakes are ghastly, despite using a quart of fluid bleeding them. They are going to try again tomorrow, which is emphatically to be our last day here, too expensive at DM7 per vehicle. This evening, we visited Cologne. There is a street market near the Cathedral, with all kinds of bric-a-brac on sale, including a surprising quantity of Nazi relics. All pretty expensive, though. We also visited a Museum of Roman Germany, at 50Pf each. A very extensive display, but our lack of German was a great handicap, as we couldn't read the plaques on the exhibits. On the run back to camp, I noted that German traffic lights take far longer than British (or, for that matter, French) ones to cycle. The disciplined Germans again? The rain has continued to plague us off and on again all day, at times quite heavily. Both tents leak rather badly around the seams; but in our case at least, this should only be a problem in really heavy rain, e.g. last night. Shadowfax is now in the hands of a British Leyland agent (there are three in Cologne), having its brakes fixed. We were directed there (and the booking made for us) by ADAC, the German AA/RAC. A most efficient organisation, if the garage is as good (we collect the vehicle tomorrow) there should be no further brake problems. (Alas it was not. Those brakes were a running sore throughout the journey). We are now on the East bank of the Rhine, just downstream from the suspension bridge carrying the E5 highway. This bridge is unusual in having its towers built of rivetted steel plates. Usually, they would be of masonry. It was built in the 30's. After leaving ADAC this afternoon, the two vehicles lost contact. We eventually located the garage, to be told the others had been, left Shadowfax, and gone. We have therefore gone to another campsite (DM8, and less facilities than the last! ), for this one night. We do not know where the others are, but will lie in wait at the garage tomorrow. Time now 2120A. Camping Carnets appear useless; no campsites recognise them, it appears that all British visitors have them, but they are worthless. May be of use farther East, though. Tomorrow, we intend camping at the roadside en route to Mannheim, checking Mannheim Poste Restante on Wednesday, and then making direct for the Czech border. Mileage reading is now 32173, making 615 miles from start. Last night was spent in a youth-campsite just downstream from the previous one (i .e. still in Cologne!). DM1.20/night instead of DM8. We shouldn't be over 21 to use it, really, but the warden stretched a point for us. Still no contact with the others: we have left a message in Shadowfax, giving our location, but they have not contacted us. This message indicates that we shall move on tomorrow. Our petrol stove has been giving a lot of trouble, due to losing pressure, which was traced to the filler-cap washer. An attempt to use a tyre-patch failed, the petrol destroyed it in a day. We are now using several layers of Lasso tape, which is reasonably successful. We must now face up to the consequences of finally losing contact with the others. I myself have always regarded the breakup as a matter of time (albeit quite a long time; possibly after Australia), which has considerably softened the impact. Keith however, is very much more affected by the prospect, as he puts it, "we are not yet ready to go it alone". On the material front, each vehicle has always been required to be technically self-sufficient, so there are no problems there. However, we shall not have the required £200 with us on entry to Afghanistan. The money exists, but is purposely held in London against the Indian Ocean ferry charges. Some solution must be found to this. (Together, the two crews could "cook the books" on arrival in Afghanistan, to appear to show £400 between them). The youth campsite here has only two parties besides us (one, of two German boys, left this morning). The other party, three English people, are travelling around Europe by train. A general get-together of about a dozen people developed on the river bank around a camp-fire last night; a welcome change to the stand-offish atmosphere of the commercial sites. We have solved the Afghanistan problem by having £100 telex-ed out from our base account in Britain. It will be released to us in DM. We should not have to spend the extra £100, it is merely to show the Afghan Customs on entry. We should have the money Friday (tomorrow) or Monday. Obviously, we stay in Cologne till then. Still no news of the others. Time is now 1200A (i.e. two hours after our departure time, according to the message left on Monday). Another campsite session last night, with some new (British) arrivals. It looks as though we may be able to stay here until Monday, in the cheap campsite. Contact with the others was re-established yesterday (when they arrived at our campsite, shortly after the above was written). They have been roughing it in the railway station, etc. Their repairs will cost some £94. It shows the value of a good road-test in Britain first. Keith cut his foot on some glass (walking barefoot) two days ago: he fears it may need hospital treatment. We are still far too careless! I have treated my old anorak with the remains of the tent-proofer, there being just enough left. Another tin can we no longer have to carry! The news of President Nixon's resignation is expected to lift the value of our U.S. dollar holdings (mercenaries!). A sudden intense downpour this morning sent us scuttling for cover (and also cleared the wasps which have plagued us at every campsite in Cologne). The weather today is rather cold and windy. Keith inadvertently left his sleeping bag atop the tent during the latest downpour, much hilarity by the rest of us, alas! Yesterday we broke camp and moved on to Mannheim, where we are now camped. Today being Sunday, we must stay until tomorrow to check Poste Restante, before heading East. Keith's foot has now mended, he doesn't rate it needs hospital treatment. On leaving Cologne yesterday, our battery failed to start the engine. Are our regulator faults in fact, due to a dead battery? We intend swapping with Shadowfax to find out. The E5 from Cologne has several extensive areas of road-works, a general resurfacing exercise. The Continentals have an excellent idea on motorways; windsocks at areas of high crosswind hazard. We got separated (again) at an Autobahn junction near Frankfurt, when Shadowfax stopped to fix a loose roof-strap, and there was no hard shoulder for us to stop on (we were already into the junction by then). Later re-found them in Weinheim (a suburb of Mannheim). Mannheim is (apparently) largely dependent on a US forces' base nearby, prices in proportion! We gave up attempts to buy food at the railway station, later bought at a campsite, apparently in woodland. It was discovered in the morning, to be across the river from a chemical works! This campsite, in a bend of the river, in fact gives 10% off for Camping Carnets, although not mentioned in the RAC list. It is run by Mannheim Corporation (i.e. the city Council). Very crowded (this weekend, anyway), facilities primitive, but it is cheap. The main objection is the loo - the smell permeates the whole site! It is clean, though. Camp was broken early-ish yesterday morning, and into Mannheim. No Poste Restante for any of us. We did a trial of swapping batteries, whereupon both systems worked normally. Our battery, back in Orodruin, is now also behaving correctly! The shortest route from Mannheim would have been from Heidelburg to Nuremberg, had the Autobahn been open. Our maps are inconclusive here. We couldn't contact ADAC, but the Weinheim police (who were very friendly and helpful, despite the somewhat forbidding look of the police station) advised that it is not yet open, and recommended us to backtrack to Frankfurt. This we did. Stopping for lunch (bread and cheese) at an Autobahn park, we met a German whose son hopes to do a similar run: passed on a few tips. Today is the first dry day for some time. We continued on the Autobahn till evening, then stopped and made (illegal) camp in a layby just out of Nuremberg. Up early (for us) at 0830A, and continued. The E12 Autobahn continues to just short of Amberg, then it is two-way traffic. We reached the German/Czech border at 1344A, and were held up 1� hours. Since our visas were made out for 7 days (maximum period, as we had understood it, we could stay less), they wanted us to change $7/day each for the full period, i.e. $98 per vehicle. Eventually we got this cut to our target time of 3 days, and changed $40 per vehicle. Given 399Kr for it, after a whole page of hand calculations which, of course, we couldn't follow. Once in, we found the Czechs very friendly, despite the rather surly exchange-office staff. Food is good and cheap, but in country areas one is supposed to order bread the day before, casual purchase is very difficult. They deliver (and, I suppose, bake) just enough to fill the orders. The general "feel" of the country is very different to the West, there are no fences around fields (or indeed, at the roadside), and village houses show a great preponderance of off-yellow paint. Very little traffic about (it falls off after Amberg on the E12), and quite a lot of very old vehicles (they seem to build to last, judging by the engine of a petrol-tanker we saw - a Polish Tatra). It was decided to press on to Prague the same evening, giving one day in the city, and one to drive south, which with today, complete our three days. (We must expect a baggage search when we leave, to judge from the German border post). Reaching Prague after nightfall, we didn't like the look of one campsite we passed. 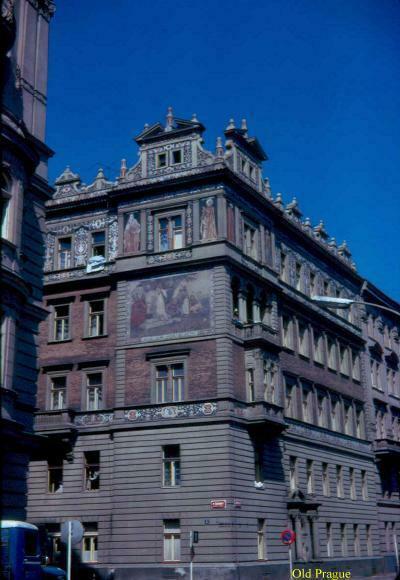 So we continued into Wenceslas Square, to see a little of the place, and for Brian to try to get his bearings for a campsite he used some years before. Each vehicle collected a 100Kr parking ticket in the Square (to be paid on leaving the country). Czech (Pilsener) beer was sampled; good, at roughly English prices, 5Kr per half-litre. Finally, we slept in the vehicles, parked in a quiet back-street in Prague. Wednesday, in Prague. I went for an early-morning stroll; the city wakes early, around 0600A. We are in a quarter occupied by large old houses, on a hillside overlooking the city, which is very hilly. Weather somewhat uncertain and showery at first, but looks like drying out okay. Prague is a fascinating city. We spent most of the day looking around, with Brian as guide. Buy food and drink in working areas (e.g. on the E12 going in) they are far cheaper than tourist areas. It is the first city we have encountered with a distinctive atmosphere (Western cities are increasingly all alike). There are beautiful old buildings, outdoor-painted walls and statue-embellished bridges dating from the mediaeval period. For 2Kr you can visit the National Archives in Prague Castle; well worth it. They have collected the treasures from the monastery libraries here; the government have adopted a very responsible attitude toward their national heritage - most praiseworthy. In the Archive is a city map of 1562, showing one district as (even then) the Old City. This is a real rabbit-warren of narrow streets, with a wonderful mediaeval clock in a square, showing the moon's phases, etc. On the west bank of the Vitava, the city is incredibly hilly, but much flatter on the East. It seems to be the boundary between the Bohemian mountains and the flat plains of Slovenia. There is just too much to take in, in Prague, we left in late afternoon to get some of the distance to Brno behind us. Camp was pitched some 40km from Jihlava, at the roadside. Considerable nuisance was experienced from mosquitoes, so we went to bed very early (for us) at about 2130A. Up early next morning, and on the road by 0700A. Czech roads are rather poor, but have excellent signposting. The main criticisms are large stretches of cobblestones, usually in towns, and numerous (un)level crossings, for which one must slow right down. Most level crossings are not gated. Yesterday proved indeed a boiling-hot day, as today looks like being also. The absence of fences in the coutryside is a welcome change from Western countries (all the fields being owned by the same co-operatives, of course), but everything seems scrupulously locked up in towns. I was most impressed by the rate of road-repair work here; they work to a rather rough but solid finish, and I saw jobs done in a day in Prague that would take Britain a week! As we pitched camp last night, we were treated to a beautiful display of what I take to have been summer lightning. Flashing behind the horizon, after dark, and lighting the clouds from above and behind. Quite silently, too. Also several fastmoving celestial objects, whether satellites or meteors we are not certain. We cleared Brno at 0930A, mileage reading 32984 - 1426 miles from London. The projected Autobahn from Prague to Brno is, in fact, only open for the last 25km into Brno. Czech drivers are much more courteous, on the whole, than Westerners, e.g. heavy loads periodically stop to allow following traffic to pass. Of Western drivers, I feel the French reputation for aggressiveness is largely undeserved; most Continental drivers seem on a par with the British. Czech filling stations don't open until 10 a.m., so queues often build up around 10-11 a.m. In view of the roads encountered so far, I am decidedly glad we are using Land Rovers. While 4-wheel drive may not be necessary, the overall ruggedness is definitely essential in a vehicle which is to be regularly used over such roads. The local vehicles, always a good guide, are very solidly built. On loading 80-octane Czech petrol, no change in engine performance has been noted so far. Again, the Brno - Bratislava Autobahn is only open for the last 30km into Bratislava. The road passes within a mile of the Austrian border at one point, but nothing to see except unreadable "POZOR!" (WARNING?) signs at the roadside, and signs prohibiting camping. The Hungarian border was reached at 1600A, we were held up for 2� hours while the Hungarians made out 48-hour transit visas for us. Running through Gyor, we went to pitch camp at 1930A, 48 miles into Hungary, in woods at the roadside. Instantly assaulted by millions of mosquitoes. After one hour, we gave up, and drove on to park 41 miles farther on, brewing up at a bus-stop en route. Spreading blankets, etc., between the vehicles in a layby, we slept under the stars; having tended our mosquito-bites. On the road at 0900A, another boiling-hot day. Reached Budapest around 1100A, and, on finding how cheap living is here, we changed more money. Petrol is 3Ft/litre, dirt cheap! So fill up before Romania. However fuel stations are few and far between, often with long queues. No fuel coupons are used. Northern Hungary is very flat, becoming slightly hillier as you approach Budapest. The roads (outside towns) are better than the Czech; there are fewer and slightly better level crossings. The drivers are the worst we've yet met, though. Traffic is heavy in Budapest, the roads bad, and the signposting atrocious! We got lost for an hour getting out, and lost contact with the others. We have driven clear of Budapest, some 30km along Highway 4, and are waiting for them. Time now 1430A. The Hungarians seem more helpful than the Czechs, officialdom is certainly easier, and our wait at the crossing point was brightened by chatting with the border guards (in bad French). In the event, the Czechs didn't collect the 100Kr parking fine, so we got away with it. I was unimpressed by Budapest, much more like a Western capital than Prague which, however, could be viewed as as sleepy city living in the past. The first thing we noticed in Prague was the absence of traffic noises! The military posture also seems far less obtrusive in Hungary than in Czechoslovakia, where military traffic is everywhere. Hardly to be seen on the roads in Hungary. We eventually continued up the road to Szolnok, and stopped there for drinks. Meanwhile, the others arrived and waited by Orodruin. They, it appeared, had got totally lost in Budapest, and had driven right round the city! We then proceeded to the campsite (recommended by the tourist office in Budapest) at Hajduszoboszlo (okay, now you pronounce it!! ), just south of Debrecen. Campsite pretty cheap (like everything here), 84Ft for the four of us, one night. Showers, etc., free. Hungary is flat, flat, flat!! Just endless plains, all under cultivation except for a marshy area east of Szolnok. The roads are all two-lane, long level straight runs. Hence, the Hungarians are lethal for overtaking, a 2-inch gap at 60 mph will do! Many slow lorries, and even horse-carts, to give them practice. Also on the eastern part, we saw for the first time, counterbalance waterlifts, or shadufs, as used in India. A wooden pole pivoted, with a long arm to raise a rope and bucket from a well, and a heavy counterpoise. One by every cottage in the fields. These cottages probably have no electricity, etc., either. We were most gratified to discover that we had made 20mpg from Bratislava to Szolnok; the flat plains contributing to this, with steady driving at 50mph. On arriving at the (Hajduszoboszlo) campsite, we found a place, but were requested to move the vehicles, as the "custodian" could not see the office from his post by the gate. A trivial argument, and indeed the French-speaking lady who runs the camp described him as mad, but a sinecure-occupying relative! We were told not to take him too seriously, but we moved across the road to save bother. The same lady confirmed that there is a road (rough but usable) from Hajduszoboszlo to Derecske, cutting off the angle through Debrecen. Back from the campsite into the town, turn left at the church, follow signs. Now 1440A, still at the campsite. We went to change money, but the campsite office was closed. The campsite proprietress directed us to an office in the town which, however, contained a most unhelpful woman, who all but threw Rik and I out! The proprietress is going to ring through there, apparently they should be open. Romanian petrol is nearly at British prices, so we plan to change $10, and with what I already have, get 100 litres, filling both tanks and two jerricans; which should take us almost clear across Romania. Apparently we had misunderstood the directions for the exchange-office, on going to the right place, no bother. Orodruin took on 86 litres of fuel, while Rik bought a vast stock of food for 100Ft. We broke camp at 1600A and made for the border, via the short cut due East from Hajduszoboszlo to Derecske, on the N47, then back to E15 for the border. The short cut was a very narrow but metalled farm road of some 20km. The Romanian frontier was reached at 1800A. A Hungarian pre-checkpoint wanted to sell us an anonymous coupon for 150Ft. We thought it was a currency exchange device, changeable into Romanian lei, so having no Forints left, we went on, after a brief discussion (if you can call it that, when we couldn't understand each other!) On arrival at the frontier proper, an English-speaking Romanian tourist officer explained it. On leaving Hungary, each vehicle pays a flat-rate tax of 150Ft (to Hungary) on the cheap fuel it exports. You may not export fuel in cans, only in fixed tanks. They didn't look too closely at our cans, so we got away with it. It means we paid about 4Ft/litre instead of 3 on the 100-odd litres we carried: still very cheap. 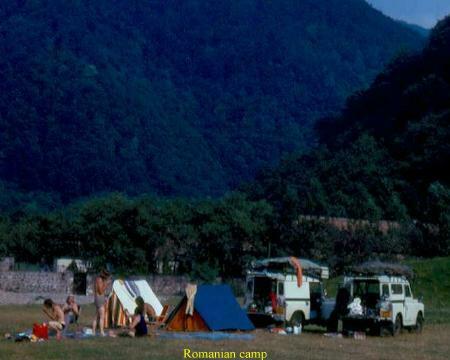 The same tourist officer also gave each vehicle a Romanian tourist map, showing all the campsites. The nearest was signposted at the border as 8km farther on, but in fact they meant 8km beyond Oradea, the first town; some 20km in all. A good site, in the middle of nowhere. They don't accept Carnets, but it only cost 38 lei between the four of us. Last night was very hot (as today looks like being), and we sweltered. Brian had the right idea, and slept in the open. The rest of us, in the tents, had a pretty hot time of it. Away fairly late in the morning (again) and off to Cluj. Romania is a welcome change from the last two Socialist countries; people, villages and landscape very colourful. For me, distinctly reminiscent of Greece, but rather less arid. The people are wonderfully friendly; we usually understand each other via a smattering of English or French. The roads are good, and pretty well surfaced, with rather less cobblestones than before. The run from Oradea to Cluj was largely flat, except for a high, steep pass just short of halfway to Cluj. Stopping in Cluj (for drinks), we immediately met two English girls (Andrea and Carol), hitching/train-ing around Europe. We took them aboard as far as Pitesti. Plodding on in search of a campsite around Alba Iulia, we pulled up at a very sordid site, whose only redeeming features were a bar, and some very friendly locals. We stopped for a beer, then off in search of a better site. We found a site at the roadside a few kilometres farther on, very primitive, but only 30 lei for the six of us. Discovering we had lost our bread and cheese, we made supper of eggs and chips. We then recalled that the eggs were bought in Germany, therefore a week old! Quite good, though. The loos from here on look like being the squat-type - ghastly! At the campsite a very friendly Romanian, Ilya, sold us a hurricane lamp for 25 lei. In the morning, we proceeded to Sibiu, where Rik went to the hospital to get his tetanus booster jab. The rest of us drank in an open-air cafe attached to an industrial exhibition. We stopped down the road, to get bread, etc. Another friendly native showed us a baker's shop down a back street/track; we never would have found it otherwise. A few miles out of Sibiu comes the "real" Transylvania: wooded mountains and gorges. We have stopped for the afternoon/evening by a river (in which Keith and I went swimming), for a rest. We thought to try fording the river with the Rovers, but it is several feet deep. Just up the track from a mental hospital! An open institution, so obviously no risk to us. The place is popular for swimming with the locals, who drive cars down to the bank, over ground we tackled in low-range gears! They don't go back up that way, though. The hospital patients occupy themselves by sorting large rocks from the river-bed, which a lorry comes down to collect, presumably for roadbuilding. The terrain is very reminiscent of northern Spain, green hillsides, etc. As dusk fell, ad nauseam Dracula jests, people with blankets making like bats, etc.! Carol was somewhat startled to see a concrete electricity pole lit up by passing headlamps. A 20ft high, ghostly-white cross! Just right for here. 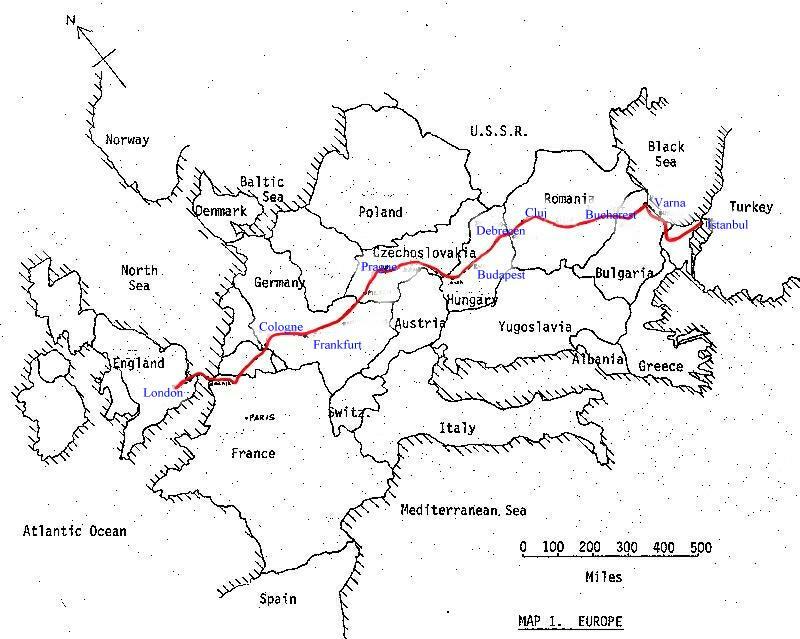 In fact, I understand the real Dracula country is north of here, towards Hungary. For a Socialist state the locals (especially some children we believe to be Gypsies) show a highly developed business acumen, being most anxious to buy our clothes, especially blue jeans. No sale, though, they only offered around 50 lei, for clothes which cost £6 or so, in London. Carol, Brian and I went to buy some cheap "plonk" for supper, and were approached by children selling "gold" rings. The initial price asked was 700 lei each, haggled down to 100 lei for four, at which Carol and I took two each. Supper of (Hungarian) spaghetti, and a puree of our tomatoes, which were going soft, and hence good for nothing else. One of Carol's rings has now been found to have tarnished overnight, i.e. it is brass. Mine, however, are still bright. All of the 20th, we stayed in the riverside camp; I collected a dose of sunburn! Since we started camping here, the place has become something of an unofficial campsite, as the idea catches on. We met a Polish surgeon, returning from a holiday in Bulgaria. He very kindly inspected Brian's "rash" (stemming from the mosquitoes of Hungary), and pronounced it an allergic reaction. He gave Brian some drugs (from his own first-aid kit), which have reduced it. However, he advises us to detour through Bucharest and take Brian to the hospital there for tests, as he has a low opinion of Bulgarian medicine. During the morning, I wandered off up a road parallel to a small tributary of the main river (and which, having much clearer water, was our supply point). Past a quarry, using some very ancient but still quite seviceable excavators, I walked for nearly an hour. Finally, I crossed the river by a very tumbledown wire-rope "monkey bridge", about 10ft from the water. Bridge length some 40ft, often nothing but four wires in a box format. Quite fun! Forded the river a few yards farther down, and back down the road to camp. My rings are, of course, also brass or copper! Almost every Gypsy tried to sell them, we suspect they are mass-produced somewhere. Yesterday, we set out for Bucharest. Our fuel was expected to last us to Pitesti, at the head of the Autostrada to Bucharest. Changing money there, we went shopping with the help of a Romanian student we met while asking directions. Manufactured foods are nearly at Western prices, but fresh fruit and vegetables are unbelievably cheap (2-3 lei per kilo). No fuel though; there is never more than one petrol station in a Romanian town, usually it seems, on the main road in from the North. So off down the Autostrada, to leave at the first exit-point, as the village 10km off the Autostrada had fuel, according to Carol's map. If, that is, we got that far. In fact we did, and took on 45 litres. The old fuel, in the event, just lasted to the only service area on the Autostrada, 36km from Bucharest. A total run of 420 miles on the Hungarian fuel. We entered Bucharest at nightfall - this driving into unfamiliar cities at nightfall is very bad planning! Losing our way twice, finally we got on the Giurgiu road, and camped in a layby 13km out. This morning, Rik and Brian have taken the girls into Bucharest, to set them on the Constanta road, and to take Brian to the hospital. Andrea and Carol have completely shared our lives for the last four days, and brightened them up considerably. However in retrospect, I feel that four is definitely a maximum size for a concern of this type, if not itself too large. Woken early in the morning by a gang dumping an excavator and transporter right beside us! On getting up, we found camped beside us, a Bulgarian family, who advised us to take the Eastern road Ruse - Sumen - Varna - Burgas - Malko Tarnovo; the road is prettier and no longer, and we avoid the Greek frontier near Edirne, with its political complications at present. The run across Bulgaria (according to the map he gave us) is some 500km. Bulgarian petrol is about 0.85 leva/litre. Also, we can buy tourist coupons for it at the border. 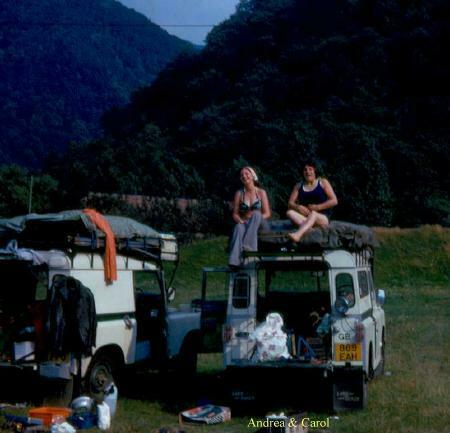 The first few miles after the previous (riverside) camp crossed the rump of the Carpathians, very mountainous country, but relatively little lift in the road, as it follows the river. After Pitesti, an industrial town, we briefly skirted the big Ploesti oilfield, with one or two small fields of up to a dozen wells, all of the pumped type. Very clear evidence of the "paranoia" common to many Socialist countries; armed guards on the river-dam before Rimnicu Vilcea, "No Photography" signs by industrial complexes, and so on. These "No Photography" signs serve only to concentrate one's attention on the prohibited object, which otherwise might well have gone unnoticed. The hospital asked Brian to return at 1400B, he decided this was too much bother, so we broke camp at 1330B. Reached frontier at 1445B, I am writing this in the Customs queue, beset by flies. Bulgaria issues petrol coupons, bought with foreign currency at the border, giving a 40% discount. Price of coupons is 4.5 litre/$US1, issued in 20-litre units. No money is then paid at the pump. We headed off on the Varna road, and tried to camp in a field. After being moved on by police, we camped again a few miles farther on. The same passing police car tried to move us on again, this time we deliberately misunderstood him and stayed put. No bother, he drove off and wasn't seen again. We have 48-hour transit visas for Bulgaria, these cost us $10 per vehicle. That's the last dollars they get out of us! Hoping to spend this afternoon by the sea coast at Varna, and tomorrow head directly for the Turkish border. Our Green Card has just over a week to run, so it will get us into Turkey okay. Later action to be defined. (In the event, we simply drove uninsured after it ran out, as far as Iran, where insurance is bought at the border on entry). Petrol stations in Bulgaria are alleged to be either 24-hour, or 0600B - 2200B. However, we found one of the latter shut at 1900B, so I haven't much faith in the Bulgarian Tourist Office, who publish the motoring map. On moving off yesterday morning, we found a parking spot 1/4-mile up the road. Could be that policeman was trying to say there was a better site up the road. Driving on into Varna, we took on food and fuel, but decided to move on down the coast, to eat, swim, and camp if possible, all in one place. We stopped at Obzor, managing to drive right down to the beach. Some swimming, and the inevitable (?) game of beach cricket, using a rubber ball, a pickaxe handle for bat, and the steps to the lifeguard's platform as wicket! Ten hectic minutes, Brian as batsman, until he hit the ball into some thorn bushes, where none of us could be bothered to retrieve it. The vehicles continue to attract their usual quota of interest from the locals, and we briefly tried to explain whence we had come and where we were going. The temperature gauge failed in Varna, the usual capillary trouble (We had had considerable bother in England with fractured capillary tubes). Electrical operation is surely the only answer here. We can live without it, using the fan-thermostat switch as a rough indication. In the evening, while brewing tea, we got nattering with four (later five) Bulgarians, one of whom spoke enough English to get us by. A very friendly crew, one of whom is a soldier stationed in a barracks in Obzor, in front of which, it now appeared, we had camped! No hassle though, indeed he brought out his C/O to join us in coffee on the sand, and tried to wangle beds for us in the barracks! This didn't come off, and eventually we slept under the stars, on .the beach. One of them had a rather jolly straw hat on; Keith tried to ask where he could buy one, and was instantly given it! Rather embarrassing, we gave him a Beatles cassette we never play. It wasn't quite clear whether he had a cassette-player, though. While driving through northern Bulgaria yesterday, several towns were passed with nice flower beds at the roadside. It was found that these are built and maintained by schoolchildren (of both sexes), doing surprisingly heavy work. As we got up this morning, the same crew of last night reappeared to say goodbye. One gave us a Bulgarian map (alas all in Cyrillic script) and a pre-Revolution banknote as souvenirs. Then a new face appeared. This man is blind, but speaks good English, learned via the BBC World Service. Now however, the BBC have changed the frequency of their Bulgarian broadcasts, and his Russian-made radio can no longer receive them. Could he buy one of ours? What can one say? We have one radio per vehicle, solidly bolted in, and in any case, declared on our Customs papers. To make it worse, he is himself an engineer, and could he but see to do it, could doctor his own radio. Equally, Keith or I could do it, given the instruments and the time, neither of which we have, being on 48-hour transit visas. As we passed through Burgas, we saw signs "ISTANBUL 406KM". We stopped to spend our remaining Levas on food just south of Burgas, but the shops were shut for the "siesta". Some kids started scrambling on the vehicles; they desisted rapidly when Orodruin's alarm went off! It's first (known) live test. In view of the shops' being closed, we decided to press on to Malko Tarnovo, and do the shopping there. Almost immediately after turning inland, one enters a restricted frontier zone. The road is subject to military checkpoints for 30 miles into Malko Tarnovo. A highly spectacular and sporting drive it is, too, with hardly any traffic, but a wonderfully twisty mountain road; the "feet jigging on an organ" effect in full play (a reference to Tim Slessor's description of Burmese jungle trails in "First Overland"). On reaching Malko Tarnovo, we found it a very sleepy frontier town, with next to no action (even the border road bypasses it). There were some wonderfully cheap cakes and (local) Coke in a cafe there; then, when the shops opened (4-6 PM), we stocked up on food. A store very much like the English village store of 30 years ago; even sugar weighed out in bulk! All very cheap, too. A few kilometres out of Malko Tarnovo (it is 9km to the border) we were held up for 15 minutes by an overturned Turkish lorry. An awful warning! He had gone some 20ft down the mountainside before being stopped by trees. Two heavy trucks were trying to pull him out, under Army supervision, and totally blocking the road in the process. Eventually they let us go through, using low-ratio to get through in the ditch on the uphill side. The border had some of the simplest formalities of any yet. Cleared through both in 25 minutes. No detailed inspection of the vehicles, but they definitely attracted a lot of friendly interest. The Customs officers constantly called them "Jeeps". Cheek! We cleared the border at 1725B, and decided to drive some 30km to clear the border area before camping. 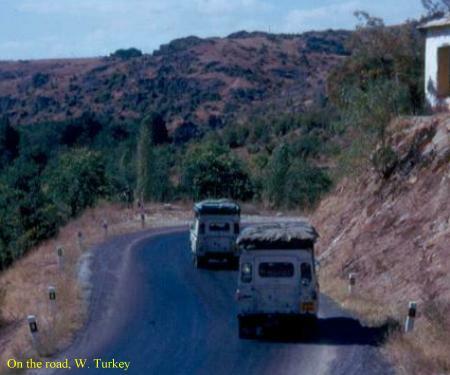 The Turkish roads are of similar standard to the Bulgarian, and another scenic drive presented itself. As we cleared the mountains at the frontier itself, the terrain became increasingly arid, very Greek in appearance. Military activity was much more in evidence on the Turkish than the Bulgarian side. We made camp beside a short level stretch of road, watched by a small boy on a donkey. (As you drive here, and in Eastern Europe generally, you are constantly waved at by children of all ages, sometimes out of friendly interest, but more often alas, begging cigarettes!). Later this small boy (aged say 8-9) returned with his younger (we suppose) brother, on another donkey. We got "talking" by the usual sign-language method, and gave them cups of coffee. European style, of course, I fear they didn't like it, though they were too polite to show it. It was by now dark, and we showed them the moon through field-glasses. This and the tape-recorder (recording their voices on a blank cassette side) proved an instant success. Eventually they left, and we went to bed (under the stars) quite early. A heavy dew fell during the night, and we were all pretty damp in the morning. We shall have to watch this. A breakfast of pancakes (which may well supplant porridge as our standard breakfast, since oats seem unknown here), and we were on our way at 0930C. Another hot sunny day. Our engine has used virtually no oil since I fixed the filter in Hungary (that filter casing had been leaking quite badly). We are now back on the E5 for the first time since Germany. Heading onwards for Istanbul, military activity everywhere. Lots of armed police and militia, often carrying SMG's and rifles. Next to no military traffic on the roads, though, only static patrols. Turkish drivers are horrific; quite the worst yet. Tim Slessor's 1956 crack about the Lebanese applies with equal force here. To overtake, never mind if it's clear, or even if you can see; lights and horn full on and go! Also, Turkish road-signs!! At hazards, they'll put up the right sign if they have it; if they haven't, anything will do. Or, if they haven't any, none at all. Thus, left-hand bend warnings at right-hand bends, "ROAD NARROWS" for "ROAD CLOSED - DIVERSION", and one totally unmarked roadworks; just a pile of rocks and a 12ft drop if you don't see it in time! Very definitely a Moslem country, a minaret in every village, instead of a church tower. On approaching Istanbul, the Kartaltepe campsite (recommended in the Golden Guide to SE Asia) was well signposted as far as the motorway system around Istanbul. Then, of course, no signs! We got lost, and found ourselves at the airport! Here, a passing Turkish motorist (who spoke English) led us to it - most kind. These BP Mocamps are very expensive (48TL per car and passengers) but have good facilities and are clean. This camp is supposed to be an overlanders' centre. We, however, have only met only one other party - four English people heading for India in a Bedford motorcaravan. They believe you can get into Iran for up to 28 days without a Carnet. We shall see! (In point of fact, so you can). They came in via Yugoslavia and Greece; the Greek/Turkish frontier is apparently open at present, though frequent and lengthy checks are made on travellers. They inform us that border insurance for Iran, etc., is typically £2.50 for 15 days. Keith believes Afghanistan is £l for 15 days. Quite acceptable. We are thinking of staying here to re-pack vehicles, and move into Asia tomorrow (! ), so as to make the maximum use of this rather expensive site. The site has a constant background din of motor-horns; Istanbul must be ghastly! We have been toying with the idea of taking a taxi ride in, just for the experience! Still in the Mocamp; we spent yesterday re-packing (the remains of Sunday we rested!). 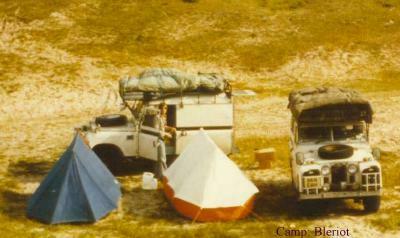 We have since met several more overlanding parties, going both ways. One has told us of a boat from here to Trabzon for 230TL; less than half the fuel cost. It has been decided to check this out today (though no decision as to whether to actually use it, if found correct, has been taken). Apparently no booking, you just show up. Boats go at 1000C, on Tuesdays and (in summer) Thursdays. The trip takes 50 hours, the vehicle goes on deck and you sleep in it. We also borrowed a copy of the BIT (London) overlanders' guide; very useful information, if proved accurate. After writing the above, we took a taxi (an unofficial taxi, run by a tout at the campsite) into Istanbul. He asked 60TL at first, Rik got him down to 25. En route, he offered us almost everything at cut rates, from cigarettes to women! The drive was a real experience; Turkish drivers will cut through any gap at any speed; on one occasion, we had three vehicles overtaking each other at some 60mph, with 1�" gap between them! Traffic lights, and even police, are almost totally ignored. The taxi dropped us opposite the Old (Covered) Bazaar, and looking across the road, who should we see but our old friends Andrea and Carol! They had hitched to Istanbul, and were staying in a cheap tourist hostel; an out-of-term students' hall. 12TL per night each, and no charge (to us) to put the Rovers in the forecourt. We have moved in there for the rest of our time in Istanbul, cheaper than the Mocamp, and right in the city, instead of 8 miles out. Istanbul is an utterly amazing city; in the bazaar quarter especially. Every street corner hides something new, and one could wander happily for weeks, spending as little or as much as one wished. We were offered almost everything imaginable, there is an extensive motor-spares area (including a well-stocked Land Rover place, with quite reasonable prices). Most of yesterday, the six of us just wandered around, looking in amazement. Later that evening we took a bus (2TL each) back to the Mocamp; there is a stop right opposite it. Today, after goodbyes to our friends there, we paid out of the Mocamp. The drive into Istanbul was unnerving at first, but you get the feel of it very quickly, and drive as hard as anyone. We reached the hostel and checked in at 1100C then, after breakfast, headed for the bazaar. Keith and I eventually got an (electrical) temperature gauge (after great difficulty; the capillary tube type are easy to get), it cost 230TL after haggling. Rik and Brian made up assorted shortages in their spares inventory at the Rover place. Then down to the shipping agents to check out the boats. Cost 465TL per vehicle (2 tonnes), and 140TL per person, third or deck-class. Hence the total cost to Trabzon is 745TL per vehicle and crew. From Istanbul to Trabzon is some 1600km (of what is reputedly, one of the worst stretches of road in the world for motor accidents), hence fuel alone for this run is some 800TL. The ship (M/V Ege) sails at 1000C on Tuesday, 3-9-74, we check in at 0800C. The chief interests of the Turks, to judge from posters, etc., are finance and war! Roadside posters are everywhere, but where you might expect Coca-Cola, etc., these are advertising banks. As for the second interest, all the news-stands have a line in posters of a highly militaristic tone, and maps of Cyprus on sale everywhere, clearly showing the island as wholly Turkish! On more than one occasion, Turks have raised the Cyprus issue with us, sometimes reasonably, once very aggressively. The London papers, he said, represented the Turks as "barbarians"; had we seen any "barbarians" in Turkey? The answer, of course, is to read a different paper! Wednesday, the six of us went exploring in Istanbul. On Wednesday evening, Rik helped a local resident, who was studying for a maths. exam. on the morrow. His brother Solly thereupon offered to act as guide around Istanbul for us, and showed us which market areas to avoid (ripoffs), etc. Spent Thursday also looking around Istanbul, and saw the Blue Mosque. Places like this defy the camera, you either use a fish-eye lens in the centre of the building, or take several hundred shots all around. I didn't have my camera with me, but doubt if I could have used it effectively anyway. (Cameras are permitted). The interior is richly covered with blue mosaic work (not painting) with, of course, no images or pictures, abstract designs only. We have been advised that Topkapi Museum and St. Sofia's are "not worth seeing" at the price asked, although it is reduced on Sundays. We also attempted to buy the boat tickets but, after being given something of a run-around of several shipping offices, were told we can't book until Monday when, of course, the price goes up! We have, however, procured (fraudulent) Turkish students' cards, which secure a 50% reduction in the passenger component of the fares. On Friday, no one did very much. Nor indeed, yesterday, with a trip to the cinema in the evening. "Poseidon Adventure" dubbed into Turkish! The others (who had seen the film before) left early, "couldn't bear to see it ruined". I, who had not previously seen it, remained, and followed the tale well enough. This hostel is pretty sordid on the whole, flies everywhere, loo-smell permeating the building, an unhygienic and apparently deviant (?) cook, an amazing electrical system - wow!! Yet we are told it is one of the best Yurdas (student hostels) in Istanbul. The flies are the worst part, they wake you in the morning, and inhabit the cafeteria constantly. After some incredible bodgery (some parts being filed to size by a street knife-grinder! ), the new temperature gauge was fitted, and calibrated in boiling water at 100�C. This morning, Keith and I watched some amazing electrical repairs to the fridge here in the hostel. It is run off the lighting circuit, and the lights dim when it turns on! Half the fridge has been defunct for five years, this half has its machinery lying out on the floor, with no safety guards at all. They were switching it on and off by tapping the wires together, producing massive sparks. While Keith and I were fixing the gauge, the others sampled a Turkish bath. 30TL, and they recommend the experience. We have the address of another student/tourist hostel, in Trabzon, only 3TL/night, i.e. a quarter of this. Will it be four times crummier? The mind boggles! Last night we all got moderately stewed on Raki, the Turkish equivalent of Greek Ouzo and Spanish Anise. like Anise, rather too sweet for my taste, I prefer the drier Ouzo. Also, it's preferable to alternate with wine (don't, as we tried, mix Raki and wine, that's a sure-fire loser!). No hangovers, though. We demonstrated that Raki will burn, with a heavy non-combustible watery residue. This morning our first concern was to book the boat tickets. Total cost per vehicle (with student cards) = 753.40TL. This was done. Andrea and Carol decided to go to Greece and thence the islands, rather than sail with us to Trabzon. Accordingly, fond goodbyes, and we gave them a lift to the railway station.